I’m back on the blog again, do I hear cheers? Ok maybe not then. The last couple of weekends have been mental and I have not had a chance to update the blog properly, for that I apologise. Last weekend I had to put up a Summer house that was going cheap from B&Q (that’s a big DIY wholesale for those who don’t know who they are over the pond). Well it turned upand was unloaded from the lorry, there was no book of words (instructions). Now I do know that being a bloke it’s mandatory to throw away the book of words as we don’t need it. But, I wanted to check that everything was there this time. To cut a long story short the wife was on the phone giving some poor geeza a hard time. I keept asking for the phone to sort it out, but I was declined my kind offer to have a word with somebody and get it sorted. It turned out that the wife tactics of being upset and complaining worked over my method of having a major rant and losing my rag! We work well – the good cop / bad cop thing! In the mean time I am preparing the car for the brake bleeding I wanted to do. No bits means I can’t put it together, I can do my brakes. I was getting out the Sealey vacuum bleeder ready, the spanners were ready, the fluid was ready, and then the car turned up with the bag of bits and the book of words as a special delivery. I thanked him through clenched teeth, and he spent a while looking at the car in the garage. He liked the car so I decided he wasn’t so bad after all. I had to make out how grateful I was at receiving the bits as I could now put all my car bits away again and go build the wooden hut, sorry Summer house! Oh yeah – like I was well chuffed. NOT. So I started to check the bits and they were all there so I started to build it. I followed all the instructions, I worked out where all the bits were to go and it was looking OK. The sky was getting dark and race against time before it rained on the untreated roof was on. The rain held off which was good and I got to the point of getting the doors on. Well they may have been dolls house doors as they didn’t fit. They will need a router on there to shave about half-inch of the hinge side to enable them to fit in the gap. The lap of the boards was concave in the middle, the doors meet at the top but had a gap I could get my hand in at the bottom. I just so love flat pack. Why was it cheap? Now I know why the doors were from a garden shed and two different ones at that. Now with the right hump, I downed tools and declared that the darkness stops play and the now darkening raining cloud was now hanging over my head following me around. Today I have been sulking a bit as I can’t do a great deal, so I decided to catch up on the blog. I have updated some pages and added a new page. 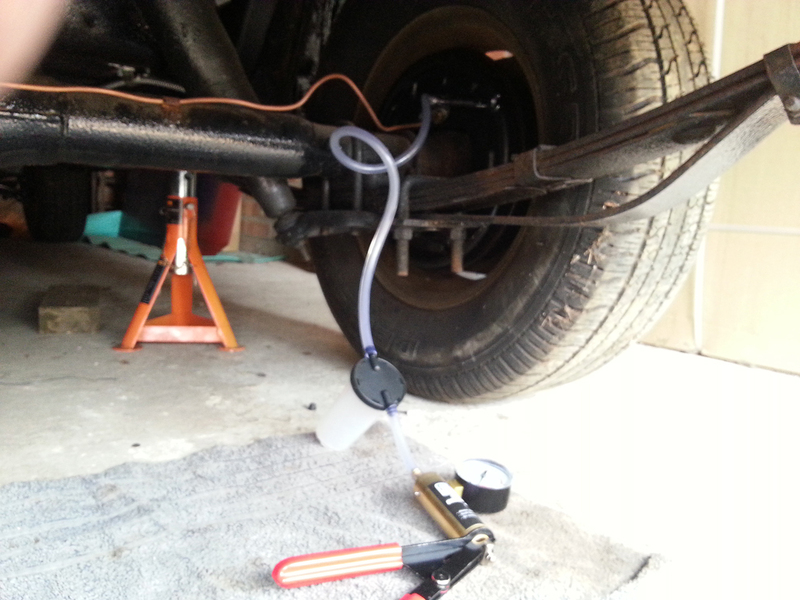 Brake bleeding and issues, or click here for the quick link. With this page I will be updating it as I go along so it will be a running guide if you like. Once I have got to use the Sealey VS402 I will post a review of it, but at the moment I has been used. Not through the lack of trying I might add. I am in the process of doing a rust comparison between the Granville Rust Cure that I have reviewed (click here) and the FE-123 treatments. I started a few weeks ago and have been watching the results so far. I will keep you updated and start a review once I have a little more time to go and results to hand. This entry was posted in Blog, Car, General, Photo's, Reviews and tagged bleeding, blog, brake fluid, brakes, FE-123, FE123, Granville, mechanic, missing parts, Mustang Maniac, rain, rear drums, rust cure, Sealey, summer house, valance, vs402. Bookmark the permalink. Reading Brakes Stop Play is like listening to a surgeon. Wow! I did have to chuckle at the ‘wife is out’ line. Love it!